See below for details, and remember this all about process, not product. Oh, and feel free to tweak the tense of the word. It is a blur of Christmas lights, celebration dinners, trundle beds, Aim toothpaste (looks like a rainbow coming out of the tube), driving on crushed sea shells, the Frank Sinatra and Benny Goodman loop, strawberry patch on the side, elbows off the table, honey suckle in the circle at the end of the street. Flying in the tree swing: to the clouds. Baked scrod for dinner. Tiny dish of lemons for squeezing. A pantry stacked with everything you’d ever need. Coffee cans turned into code transmitters. 1. Each week, I will choose three words from the jar. 2. I'll post the three words here and on the Red Bird Crafts Facebook page where I'll use #redbirdwritealong. 4. We'll make our short pieces public. 5. You are welcome to read the comments on the Write-Along posts to see what others have shared. I plan to share my writing and I'd love it if you'd share yours as well. I also encourage you to share on Instagram or Facebook (or Twitter). 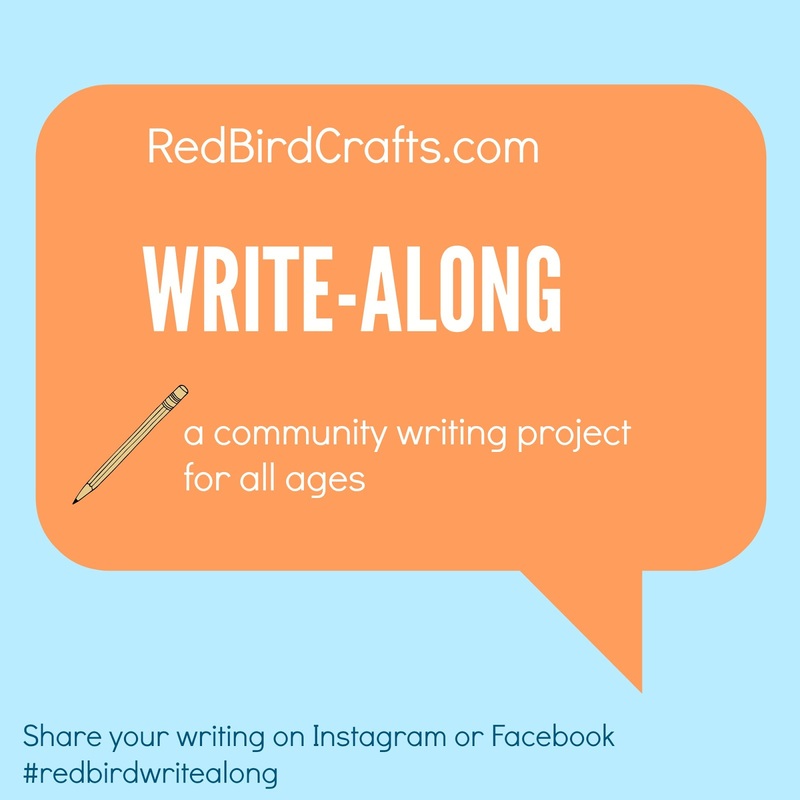 If you choose to share on social media, be sure to tag it with #redbirdwritealong, so we can all read. If you choose to post on Facebook, would you consider posting on the Red Bird Crafts Facebook Page, so we can all read? Of course, you can keep your creation private -- maybe in your journal or taped to your fridge? You know that is ok too. Some of the writing might not be kid appropriate, so it is important to screen the content before letting children read directly from the blog. This will happen weekly or bi-weekly. Anyone is welcome to join: adults, kids, elders, teens, and even children who are pre-writers (you can write their words for them).